Also it is necessary to create a DataSource definition in the file standalone.xml. It is recommended to deploy the driver as module. To deploy the Derby driver directly you simply copy the driver derbyclient.jar into the directory [JBOSS]/standalone/deployments. 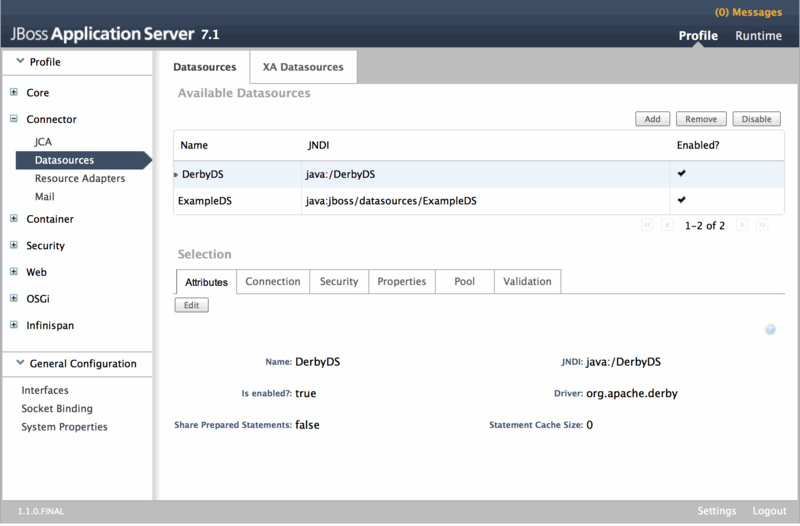 If the server is running the new file is recognized by JBoss and automatically deployed. 14:58:20,337 INFO  [org.jboss.as.server] (DeploymentScanner-threads - 2) JBAS018559: Deployed "derbyclient.jar"
Copy the Derby JDBC driver derbyclient.jar into the directory [JBOSS]/modules/org/apache/derby/main, too. Now you have to adapt the file standalone.xml in the directory [JBOSS]/standalone/configuration. Add the following datasource definition in the section datasources.